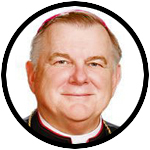 In the wake of the Feb. 14 school shootings in Parkland, Florida, which left 17 people dead, Archbishop Thomas G. Wenski of Miami wrote this spiritual reflection for Catholic News Service on how we as Catholics deal with such terrible acts. Archbishop Wenski has been attending funerals for some of the slaughtered youth. Marjory Stoneman Douglas High School is in Broward County, which is in the Miami Archdiocese. Once again, we witnessed a tragic and senseless shooting — this time in South Florida, at Parkland’s Marjory Stoneman Douglas High School. We all are understandably outraged when innocent children are made victims of senseless violence. And, as the appalling dimensions of this tragedy continue to unfold — the missed signals that were they heeded might have prevented this latest national heartbreak — we recoil in anger and in exasperation we seek answers on how to prevent future occurrences of such carnage. Students from Stoneman Douglas and others have traveled to Washington and Tallahassee seeking action urging lawmakers to address gun violence and the proliferation of firearms in our nation. These are legitimate concerns and need to be addressed along with the failure of our country to face the dearth of mental health services. Families who have members suffering from serious mental health issues can speak of their frustration at securing prompt, effective and comprehensive help for their loved ones suffering from various mental illnesses so that they will not present a risk to themselves or others. Complacency and inaction can no longer be tolerated. However, whatever the possible remedies proposed will be of small comfort to those who lost sons and daughters, siblings, spouses and friends or to the survivors who have been traumatized. Likewise, in the face of the evil they experienced on Ash Wednesday of this year, there is no answer that can adequately explain why this horror was visited upon them. Our words are as insufficient as those of Job’s erstwhile friends who sought to “explain” to him the reasons for his fate. Yet, faith — confidence in what we hope for (cf. Hebrews 11: 1) — even in the face of the harsh reality of death is a light in the darkness of grief. We turn to Mary who at the foot of the cross held in her arms the broken body of Jesus and we ask her help so that in our grief we continue to trust in God and his mercy for us all. We believe in God — and we believe that God did not make us just to die one day. Our faith in Jesus Christ crucified yet risen from the dead gives us light and our hope in him who conquered death consoles us and strengthens us even in our grief. But, grief remains a heavy cross to bear; and, it is a cross that no one should carry alone. Those who grieve, especially when their grief is still quite raw, do not need answers as much as they need us to walk with them in compassion and love. As I reminded mourners at two of the funeral Masses of the Stoneman Douglas victims, the grieving of these families will not end when they return from the cemetery after their loved ones are buried. The faith community must continue to accompany them in the weeks and months ahead. But, Jesus does give us an insight on how God deals with the tragedies that afflict us. God does not remain remote from or indifferent to the plight of his fallen creation. In Christ, the Word became flesh. God became man. Rather than distancing himself from people and their tragedies, he draws close to them. From the cross, he stands in solidarity with all the pain experienced by us in our fallen human nature. Despair, destruction, death will not have the last word: Rather the transformative power of his Resurrection anchors us in hope. NEXT: Catholics want better preaching, but are they listening?